You actually can buy special lenses for your Nikon D3200 that produce the soft focus effect, but a cheaper alternative is to apply a focus-softening digital filter like the one found on the Retouch menu. You can see the results in the following figure. When applied to nature subjects like the one in the figure, the filter creates a look that’s similar to the watercolor-effect filter you find in many photo editing programs. Squint hard enough and you can almost envision a Monet in the making. Display your photo in single-image playback mode and press OK to call up the Retouch menu. Highlight Filter Effects, press OK, and then highlight Soft as shown in the following figure. You have to scroll to the second page of the Filter Effects screen to get to the Soft filter. The Soft filter is found on the last page of the Filter Effects menu. You see thumbnails of your photo, as shown in the following figure. The left thumbnail is the original; the right thumbnail offers a preview of the filter effect. Press the Multi Selector up or down to choose the strength of the effect. 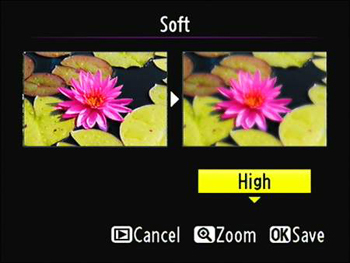 Press the Multi Selector up or down to determine how soft you want the image. Your choices are Low (kinda soft), Normal (softer still), and High (pass the foggy goggles). While you’re pondering your decision, you can press the Zoom In button to get a better look. Press OK to apply the filter and save a copy of the retouched image.